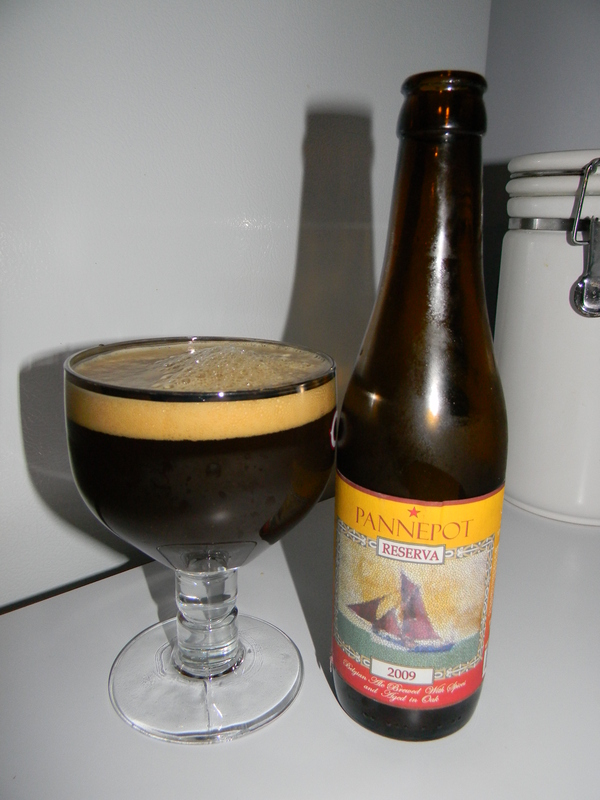 Review of Pannepot Reserva (2009) | Beer Apprentice - Craft Beer News, Reviews, Interviews and Info. Hello guys. For today’s craft beer review I’m going to be trying a 2009 Pannepot Reserva, which is produced by De Struise Brouwers located in Oostvleteren, Belgium. I’ve heard nothing but great things about this beer and I can’t wait to try it. The website, struise.noordhoek.com, was all weird, so I’m just going to pop over to ratebeer.com and see what kind of commercial description I can find if that’s all right with you guys? The Pannepot Reserva was an idea from my brew collegue Carlo who wanted to age Pannepot in genuine French oak barrels (barrique 225 liters). We have brewed 90HL at the end of 2005 which has been aging on oak ever since (14 months). 30 Hl was bottled Tuesday 8th May 2007. 60Hl has been transferred now to second hand calvados oak vessels and will be bottled again early autumn 2007, we will name that batch Pannepot Grand Reserva. As quality and results rule at Struise, the Reserva was already brewed again and aging on oak. Nice!!! Let’s drink this thing. What do ya say? This brew came in an 11.2 oz. bottle and it had an ABV of 10.0%. It poured a deep burgundy to brown color with some deep ruby hues. The cap was khaki colored, smooth and semi-creamy. It was sized very well and the retention time was very good. The lacing looked nice and clingy. A very attractive looking beer to say the least. The aroma was filled with rich and juicy dark fruits. Some grape, fig and prune intermingled with a ton of Belgian yeast. Tones spicy clove along with touches of chocolate and caramel sugar. Hints of oak and wood stepped up at the back end to create a very complex, but well balanced and gorgeous bouquet. The taste mirrored the fragrance altogether. Robust dark fruits with well appointed and near perfectly blended oak. The clove was matched extremely well and the chocolate and caramel added the most subtle and welcomed sweetness. No discernible alcohol to speak of either. Just a fabulously balanced and great tasting beer. The mouthfeel was medium bodied. Smooth, creamy, slick, chewy and dry. It slid right down. The carbonation was excellent for a beer that had about 4 years of age on it. A suburb amount of flavor was left behind on the palate after each sip too. Man… what a great beer!!!. This brew deserves to be ranked right up there with the best Quads in the world. Yes, I’m even saying that it’s in the same class as the Westy XII, St. Bernardus Abt. 12 and the Rochefort 10. I would definitely recommend that you guys give the Pannepot Reserva a try if you can find a bottle. I’m not sure how easily it is to get across the country, but when I saw it I had to grab it. I’m so glad I did too. It was definitely worth the somewhat expensive price tag. If you’ve ever had this beverage please leave a comment. I’d love to hear your interpretation.